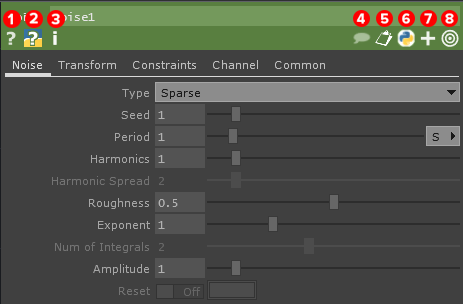 The &apos;Parameter Window&apos; is where all an Operator&apos;s parameters can be accessed. There are two ways to access the &apos;Parameter Window&apos;. The first is using the &apos;P&apos; key. This will open a docked &apos;Parameter Window&apos; in the top-right hand corner of the pane. This docked &apos;Parameter Window&apos; will display the parameters of whatever Operator is selected. The second way to access the &apos;Parameter Window&apos; is by right clicking on an Operator and selecting &apos;Parameters...&apos;. This will open up a floating &apos;Parameter Window&apos; for the Operator. This method differs from the first in that the parameters will not change if another Operator is selected. This is useful for being able to manage the parameters of multiple Operators simultaneously.